Wear your badge proudly as you display it on your website, your e-mails, your social media sites, blog, and more! Enjoy, and remember to get the rest of your community to Speak Up! 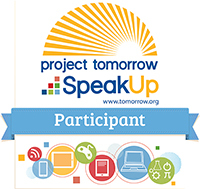 Click here to download a low-resolution badge for web use. 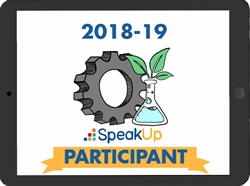 This year’s Speak Up badges were designed by our wonderful student participants, Paloma Rodriguez and Matison LeBlanc! 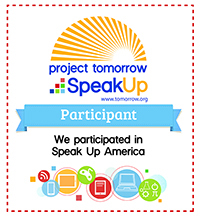 Thank you, students, and keep on sharing your voice with Speak Up! Wear this badge proudly as you display it on your website, your e-mails, your social media sites, blog, and more! 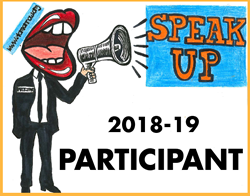 Enjoy, and remember to get the rest of your community to Speak Up! 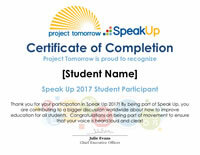 Congratulate your students on being part of a movement to ensure that their voices are being heard loud and clear with this Speak Up participation certificate! Click here to download a word document for print.